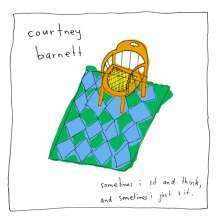 (is) Australian singer-songwriter and guitarist Courtney Barnett released her first full-length album ‘Sometimes I Sit and Think, and Sometimes I Just Sit’ in March 2015, for which she was nominated at this year’s Grammy awards in the Best New Artist category. An astute raconteur, Barnett captivates the listener with her ramblings and musings on the absurdities of life as a twenty-something in Australia by effortlessly weaving witty anecdotes with snippets of her ruminations on the most mundane of observations. Lyrics range from clumsy attempts at impressing a swimmer in her foggy goggles in ‘Aqua Profunda!’ to battling with depressive thoughts triggered by the drab interior of a suburban villa while house-hunting in ‘Depreston’. Barnett’s style has been compared to the quintessential 90s figure of the slacker (cf Richard Linklater’s 1991 film Slacker) with her musical influences including indie heavyweights such as the Breeder’s Kim Deal and Pavement’s Steven Malkmus. Packed with amped up guitars, lashings of distortion and more reflective broody moments, ‘Sometimes I Sit and Think, and Sometimes I Just Sit’ is not a simple rehash of 90s alternative rock tropes, instead it wins you over by sounding refreshingly familiar.